I had many questions when switching from my iPhone camera to a larger mirrorless setup. The first involved how I was going to carry it. I used to hike with a heavier Canon DSLR, but it was just too heavy and spent most of the time in my pack. That experience is what prompted me to hike with my iPhone, but the subpar image quality always left me desiring something more. The perfect “inbetween” has been the combination of my Sony a6000 and Lowepro Compact Courier 80. I can now attach my camera setup to a hip belt via carabiner, store it in a side pouch, or quickly throw it in my bag without missing a beat. The Compact Courier 80 is the perfect bag for hiking and backpacking. It’s lightweight, durable, weatherproof, and incredible versatile. The first thing you’ll notice when opening the Compact Courier 80 is the velcro SD card holder and battery pouch. The SD card holder is large enough for two extra cards in a plastic case, and the battery pouch fits two batteries comfortably (NP-FW50). I’ve squeezed a third battery in for weekend trips, but it’s a very tight fit. I wish the battery pouch had a zipper, or some sort of weatherproofing, but thus far I haven’t had any issues with moisture. I’ve had this bag out in snow and light rain, and it’s done a great job of keeping things dry. It’s not waterproof, but can handle about 20-30 minutes of light precipitation. The zipper used on this bag is of pretty decent quality, as I’ve yet to experience a snag or break under heavy use. The ties on each zipper work well with thick padded gloves for use in cold environments. 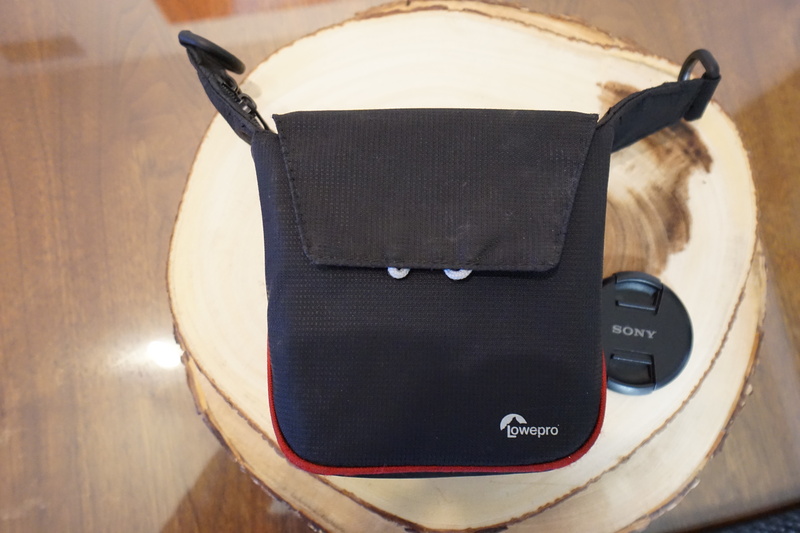 The inside of this bag is just big enough for my a6000 with Sony 10-18mm lens. If you’re using a smaller pancake, you could have room to store another lens option. I tend to hike with only the lens attached to my camera. If you’re the type that likes to bring an arsenal, this is not the bag for you. The padding is adequate, as I’ve stuffed this into a full pack, rolled over it with my body in a tent, and bumped it up against some formidable granite without any damage to the contents inside. As for specs and options, that’s just about it for this bag. It’s a very simple piece of kit, and for $10, a great buy in my opinion. I wish it had better weather proofing, and I know some will desire more storage options. Both of those additions would come at an increase in size, weight, and cost. For my needs, this bag does the trick, and after months of hard use, shows no signs of letting up. I was looking at some of your content on this internet site and I believe this website is real instructive!